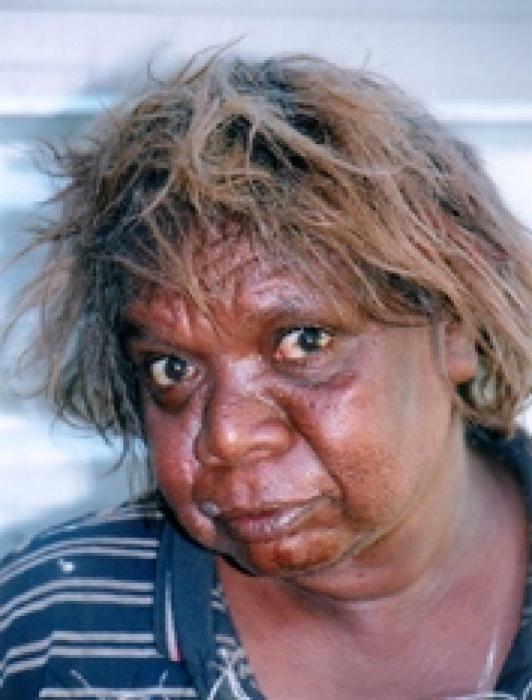 Lorna Ward Napanangka was born in 1961 in Papunya. Her father was the famous Timmy Payunka Tjapangati, one of the first generation of the Papunya Tula Artists. Lorna herself began painting in 1996. She generally paints the traditional ceremonial site at Marrapinti. “Tingari" women (mythical ancestors) camped at this site during their travels towards the east. Whilst there the women made nose bones, also known as Marrapinti, and upon completion of the ceremonies at the women continued on towards Lake MacKay (Kiwirrkura). Lorna Ward painted on the collaborative artwork Kiwirrkura a women's painting to contribute to the Western Desert Dialysis Appeal in 1999 after which her standing as an artist steadily began to rise. Lorna’s style is extremely varied. Seemingly effortless she moves from style to style, from medium to medium, and from color to color. Line and dot work mixed together create a balance between the solid and the void. Her fine and rhythmic work evokes styles as diverse as the severe Western Desert formalism of Anatjari Tjakamarra, the grid patterns of the Tiwi islands and semi-geometrical Art Deco motifs. This enormous versatility and collectability is recognised by collectors worldwide. Lorna has exhibited in Australia and overseas and was a finalist in the 2002 NATSIAA. Lorna and her husband Billy Ward, a well known Aboriginal artist in his own right, move between the important art communities at Kintore and Kiwirrkura in Western Australia.